Google Ads, previously known as Google AdWords, is a popular Pay Per Click (PPC) or Cost Per Click (CPC) advertising program. It works in conjunction with Google AdSense program for publishers. Advertisers can create ad campaign to display ads on Google search and display network (AdSense publisher’s websites) and pay only when users click on their ads. Paid advertising like AdWords is necessary to boost the traffic especially for a new online business and websites. Promotional offers are win-win situation, where Google earns more from advertisers and advertisers get more traffic from publishers. Hence Google offers various timely and country specific promotional vouchers for new Google Ads customers in order to encourage online advertising. There are many Google Ads promotional codes from Google and various other partners. Below are some of the easy ways to get promotional offers. Register for a Google Ads account as a new customer and you will most probably can find a coupon on home page on most of the country’s landing page. For example, you can find the coupon for $100 for US and Canada users when you spent $50. Signup for Google Analytics account and Google will send around $150 coupon periodically. Look for marketing offers from hosting and website building companies. For example, HostGator offers $100 when you spend $25. Below are the coupon codes currently we have found, use the search box to filter your country from the list. Get your free coupon by clicking on the coupon link and start your online ad campaign today. US Get $75 in ad credit when you spend $25 Get Your Coupon Now! US Spend $25 and get $100 free (AdWords Express Partner Offer from Comcast for Business Class Customers) Get Your Coupon Now! US Spend $25 and get $75 Get Your Coupon Now! US Spend $25 and get $100 free (Partner Offer from Weebly) Get Your Coupon Now! US Spend $25 and get $100 free (Partner Offer from Endurance) Get Your Coupon Now! Unites Arab Emirates Spend 100 AED get 300 AED Get Your Coupon Now! UK Get £75 in ad credit when you spend £25 Get Your Coupon Now! UK Spend £25 to get £75 Get Your Coupon Now! Thailand Save up to 1,500 Baht Get Your Coupon Now! Taiwan Save up to NT$ 1,500 Get Your Coupon Now! Sweden Spend 250 kr to get 750 kr Get Your Coupon Now! Sweden Spend 250 SEK to get additional SEK 750 Get Your Coupon Now! Spain Spend €25 and get €75 Get Your Coupon Now! South Africa Spend R200 and get R600 Get Your Coupon Now! Slovenia Spend €20 and get €60 Get Your Coupon Now! Singapore $50 free advertising coupon (Partner offer from VISA) Get Your Coupon Now! SGD 100 Get Your Coupon Now! Singapore Spend $25 and get $75 Get Your Coupon Now! Saudi Arabia Spend 100 Riyals and get 300 Riyals Get Your Coupon Now! Russia Spend 600 Rubles to get 1000 Rubles Get Your Coupon Now! Portugal Spend €20 and get €60 Get Your Coupon Now! Poland Spend 100 Złoty and get 200 Złoty Get Your Coupon Now! Philippines Get ₱2000 in ad credit when you spend ₱500 Get Your Coupon Now! Norway Spend 250 Kr get 750 Kr Get Your Coupon Now! New Zealand Get $100 in ad credit when you spend $25 Get Your Coupon Now! New Zealand Turn $25 into $125 Get Your Coupon Now! Netherlands Spend €25 and get €75 Get Your Coupon Now! Netherlands Spend €25 to get €75 Get Your Coupon Now! Mexico Spend 900 MXN within 31 days and double the spending Get Your Coupon Now! Malaysia $50 free advertising coupon (Partner offer from VISA) Get Your Coupon Now! Malaysia Get RM150 in ad credit when you spend RM50 Get Your Coupon Now! RM200 Get Your Coupon Now! Latvia Spend €10 and get €40 Get Your Coupon Now! Korea Save up to ₩ 100,000 Get Your Coupon Now! Japan Spend 2,500 Yen and get 10,000 Yen Get Your Coupon Now! Italy Spend €25 and get €75 Get Your Coupon Now! Italy Spend €25 to get €75 Get Your Coupon Now! Israel Spend $100 and get $300 Get Your Coupon Now! Ireland Get €75 in ad credit when you spend €25 Get Your Coupon Now! Indonesia $50 free advertising coupon (Partner offer from VISA) Get Your Coupon Now! Rp. 600.000 Get Your Coupon Now! Indonesia Get Rp 450000 in ad credit when you spend Rp 150000 Get Your Coupon Now! India (Hindi) Save up to Rs.2,000 Get Your Coupon Now! India (English) Save up to Rs.2,000 Get Your Coupon Now! India Get your free Rs. 2,500 advertising credit (Partner offer from VISA) Get Your Coupon Now! India Up to Rs 2000 in promotional credit Get Your Coupon Now! Hong Kong $50 free advertising coupon (Partner offer from VISA) Get Your Coupon Now! Hong Kong Spend 100 HKD and get 400 HKD Get Your Coupon Now! Hong Honk Get 400 HKD in ad credit when you spend 100 HKD Get Your Coupon Now! Germany Spend €25 to get €75 Get Your Coupon Now! France Spend €25 to get €75 Get Your Coupon Now! France Spend €25 and get €75 Get Your Coupon Now! Finland Promotional credit of €75 when you spend €25 Get Your Coupon Now! Estonia Spend €10 and get €40 Get Your Coupon Now! Canada Get $75 in ad credit when you spend $25 Get Your Coupon Now! Canada Spend $25 and get $100 free (AdWords Express Partner Offer from Comcast for Business Class Customers) Get Your Coupon Now! Belgium Spend €25 and get €75 Get Your Coupon Now! Austria Promotional voucher of €75 when you invest €25 Get Your Coupon Now! Australia Get $100 in ad credit when you spend $25 Get Your Coupon Now! Australia Spend $25 and get $100 Get Your Coupon Now! Argentina Spend ARS 300 within 31 days and double the spending Get Your Coupon Now! In case if the coupon link is expired, you can call the AdWords support center for your country and ask for the promotional offer for new customers. Also you can create new AdWords account. Google periodically sends out coupon code to the physical address and to the registered email id for all customers to encourage advertising with AdWords. Google also offers special promotional ad credit only for eligible nonprofit organizations up to $10,000 USD in in-kind AdWords advertising every month. Check out the offer if you own a non-profit organization. Nowadays every companies, starting from domain registration to SEO services, offer promotional coupon code for Google AdWords. Here are some important terms for using Google AdWords coupon code in your account. 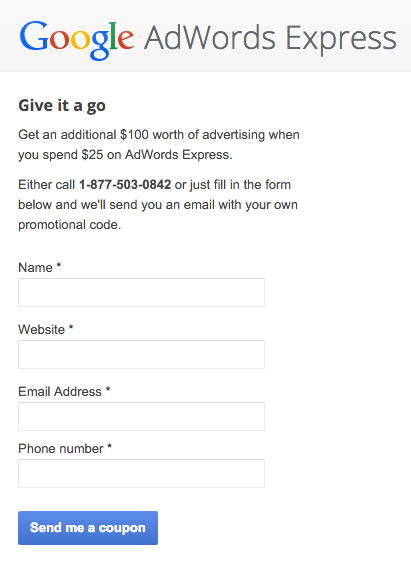 AdWords and AdWords Express needs separate accounts in order to redeem the coupon code. Some offers only need your email id and Google will send the coupon code in few business days after submitting the form. Some other offers need you to enter phone number and business website for getting the coupon. Check the validity of promotion code and apply in your AdWords account within the specified time. You need to add the payment details in AdWords account like credit card before redeeming promotional code. Most of the offers are like spend $25 and get $100 which means only after spending $25, your account will be credited with $100 within 5 business days. You need to spend the specified amount within 31 days of entering coupon code. Offers are valid for specific countries and coupons are validated based on the account currency and payment method. Offers are applicable only for customers who opens new AdWords account and promotional code needs to be applied within 14 to 21 days of account opening based on your country. AdWords does not offer PayPal payment method like Bing Ads. How to Redeem AdWords Promotion Code? In order to redeem your Google AdWords promotion code, you need to first add billing information in your account. Click on the “Tools” icon and go to “Billing & payments” option under “Setup” section. Choose the correct country and enter other details like whether you are a business or an individual. Finally add credit card or payment method accepted on your country and save the changes. Once the billing method is added again go to “Billing & payments” section. Go to the “Settings” menu in the left sidebar. Scroll down and click on the “Manage promotional codes” option. Click on “+ Promotional code” and enter your coupon code. How to Delete AdWords Account? After advertising with AdWords promo coupon for particular duration you need to pause or delete the campaign in order to avoid paying money from your pocket. 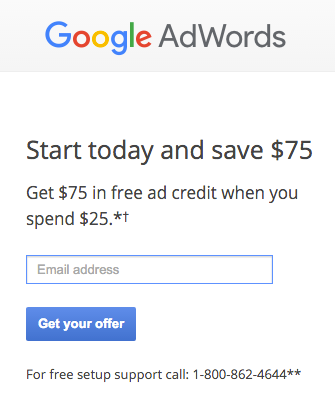 You can also completely delete your AdWords account and create a new one to get another promo code from AdWords. We strongly to pause the ad campaign before the billing instead of deleting the account. Follow the below steps if you still want to delete your AdWords account. Login to your AdWords account and click on the “Tools” icon. Go to “Preferences” option available under “Setup” section. Click on the “Account status” and then “Cancel my account” option. Confirm the account deletion to delete your AdWords account. Note if you already accrued any cost more than your promo code value then you will get the invoice within 60 days even though you delete your account. I have requested the coupon code for VISA provided one. Let’s see how it goes. Please send me link for Russian federation. How to use international credit card with adwords billing. International or domestic credit cards – there should be an address linked to that. The billing and promo code will be decided based on the address linked to the credit card. How do I get coupons, Am from Zimbabwe?